In a recent interview owner Mark Davis stated at this time there are no plans to share the new 49er's stadium that is already under construction and a mere "stones throw" from Oakland in Santa Clara. There are also many issues regarding any possible move to LA and into one of the two new stadiums that are currently under proposal. The Raiders current stadium is 46 years old and beyond renovation that would make it fitting football stadium. So what are the Raiders going to do? 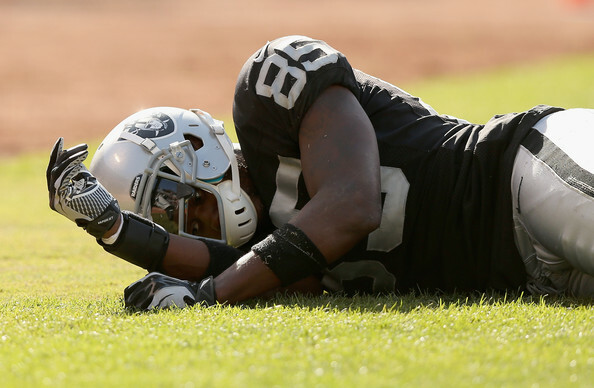 Pic of the Day- Darrius Heyward-Bey laid unconscious on the field for over 10 minutes after a helmet to helmet collision. His injury seemed to motivate the Raiders who went on to win. Today he was released from the hospital and is supposed to be ok. He suffered a concussion and neck sprain but no permanent injury. OK, I know it isn't really Monday Night Football, but it feels like it to me. After all, the Raiders are on ESPN at 5PM on Monday Night for their first preseason game against the Dalllas Cowboys. It figures that our starting quarterback, Carson Palmer, will see action but probably not much past the 1st quarter. Then it will be our first chance to get a look at Matt Leinart who was signed as a free agent during the off season. Pic of the Day- It was hard to find one pic that said it all, but featured here is new head coach Dennis, new GM Reggie McKenzie, and new owner Mark Davis. 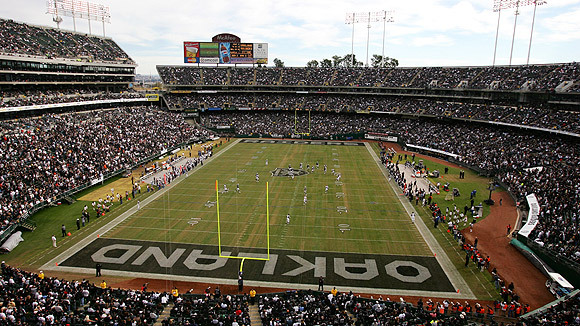 With the passing of Al Davis during the regular season last year, it was easy to expect that there just might be big changes for the upcoming season in Oakland. Mark Davis wasted no time clearing house in the front office and brought in a new GM Reggie McKenzie. 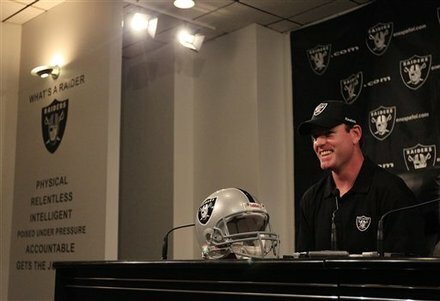 The Black Hole is a new weekly feature that gives you a quick read on the latest news, rumors, or updates on the Raiders. The Oakland Raiders made a franchise changing trade to replace injured quarterback Jason Campbell, trading two high draft picks on Tuesday to the Cincinnati Bengals for Carson Palmer. The trade leaves the Raiders with picks only in the fifth and sixth round in next year's draft. A Legend has passed. Al Davis was the Oakland Raiders. It was his creation, his passion, his team. You have to think that when the Raiders won last Sunday on the last play of the game, Al looked down from the heavens and proclaimed......Just Win Baby! 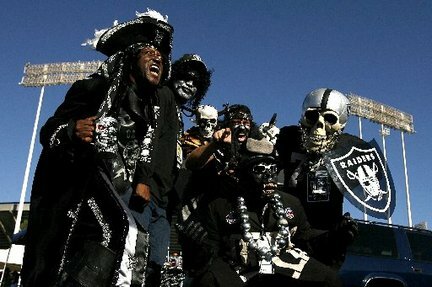 This is the first installment of our Raider Nation Fan of the Week contest, where we search all of the photo galleries out there looking for the most impressive fans of the Raider Nation. 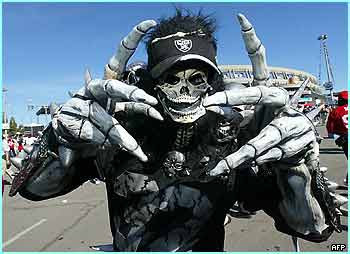 Each week, we will honor a diifferent guy or girl who has shocked the world with their finest Raider attire. So far, I have found many pics of the ladies that I would love to be winners, but I am afraid to post them here. Wow! In a surprise move the Raiders cut Trent Edwards, making Terrelle Owens the #3 Quarterback on the roster. 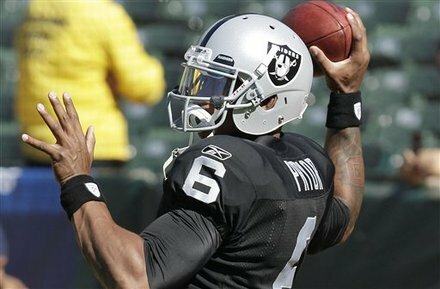 Now that the Raiders have played 5 games, Pryor has joined the Raiders on the practice field and will be available to play in games if necessary. Expect Terrelle to be used on occasion in wild cat style formations or as a WR with the option to pass behind the line of scrimmage. I think most of us are real proud of the job Hue Jackson has done while coaching the Raiders so far. Just Win Baby. With Coach Hue the "Bully" is back. And you have to admire his never say die attitude. He epitomizes the power of positive thinking. The glass is never half empty or half full......it's FULL.